After debuting its latest collaborative footwear during Robert Geller’s Fall/Winter 2019 runway show, the designer and longtime brand partner Common Projects have released three colorways of the upcoming runners. The high-top styles are defined by heavy contrast throughout, from the distinct hues that have been coated on the laces down to the colorblocked details along the upper. Geller worked with athletic label Lululemon for his FW19 assortment, and several shades from the sporty apparel pieces have been threaded along the footwear for coordinated head-to-toe looks. Each sneaker is accentuated with bright laces, including fuchsia on the “Brown” edition, neon green on the “Grey” version and a peach tone on the “Black” model. Oversized heel tabs in flashy pink and green further the vibrant aesthetic. The body of each shoe has been crafted in a mix of neutral suedes to ensure ample outfit options. While the black and grey colorways have been paired with olive green for an earthy palette, the brown is teamed with a tan toe cap and side panels for its own natural look. A cream midsection and black outsole round out all three sneakers with a clean finish. The Robert Geller x Common Projects Runner retails for $575 USD. It’s available to purchase now from Moda Operandi’s webstore. 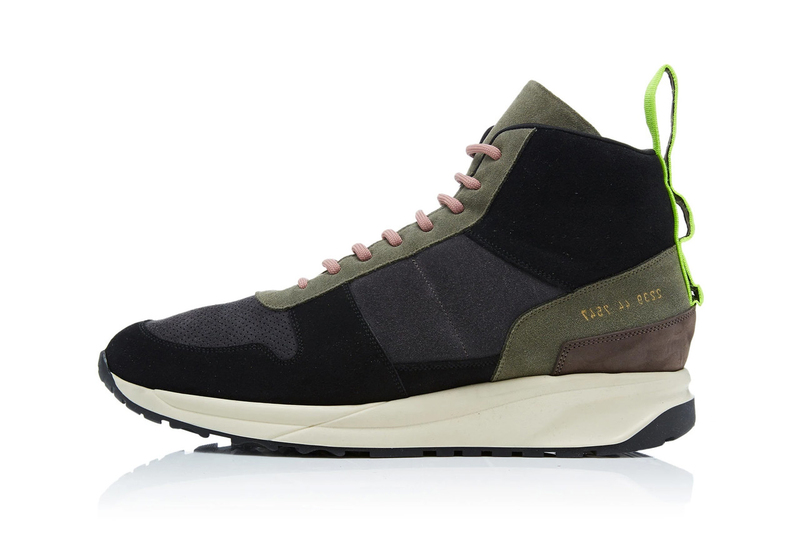 For more in fashion, check out Fear of God’s Western-inspired Sante Fe Boot.